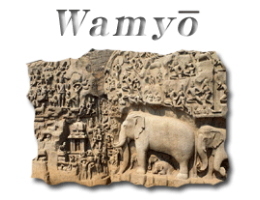 Wamyo is the last word of the metrical part of the Introduction of Hoke-kyo (the Lotus Sutra) The text describes the state that the Buddha's teachings spread throughout the world as a natural result , as one of the bells lined on a curtain beginning to ring makes all of the other bells resonate with it. Instead of the opening adress, I hope this site will take root like the big zelvoka tree from which the name of the temple originated. Jugen-ji used to be a huge temple of which name was Toho-zan Io-ji and belonged to Shingon-sect until the end of the Kamakura- period. It was all burned in a war except Yakushi-do building in which Yakushi-nyorai was ensurined and became almost ruins for some time . 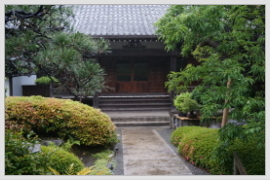 During the Kanei-period(1624-44 of the Edo-period ), the wife of Kichijyu Karibe , a master of the honjin ( an officially appointed inn for the use of daimyo in the Edo period) of Hodogaya stage, devoted herself to the Nichiren sect and she secluded herself in a hermitage by the big zelkova tree beside the Yakushi-do building which had remaind from the fire, and open Jugen-ji as one of the branches of Minobu-san Kuon-ji ,the headquarters of Nichiren-sect, inviting Priest Zentsu-in-Nichiryo who was her teacher . A founder, Nunn Myosyu died in 1632 and Priest Nichiryo died in 1657. Yakushi-nyorai, which was a vestige of the Io-ji was said to be a buddha who cured deseases and saved people from sufferings and was enshrined in the small building standing out side the temple gate and was accepted pray for recovery from eye desease. He is now installed in the building which was erected to commemorate the sevenhundredth death anniversary of saint Nichiren in 1979 and attracts people's belief. copyright©2013-19 JYUGENJI all rights reserved.